THE second session of the Intergovernmental Panel on Forests (IPF) was held from March 11-22 in Geneva. Delegates conducted their first substantive discussions of six programme elements: underlying causes of deforestation and forest degradation; fragile ecosystems affected by desertification and the impact of air pollution on forests; needs and requirements of countries with low forest cover; international cooperation in financial assistance and technology transfer for sustainable forest management; assessment of the multiple benefits of all types of forests; and methodologies for proper valuation of the multiple benefits of forests. The IPF was set up by the Economic and Social Council, on the recommendation of the third session of the Commission on Sustainable Development (CSD), as an open ended ad hoc body to pursue consensus and coordinate proposals for action to support the management, conservation and sustainable development of forests. In pursuing its mandate, the IPF is focusing on I I issues clustered into five interrelated categories and will submit final conclusions and policy recommendations to the CSD at its fifth session in 1997. The first meeting of the IPF took place in New York from September 11 - 15, 1995. At this meeting, delegates had elected Martin Holdgate (UK) as co-chair from the developed countries and N R Krishnan (India) and Manuel Rodriguez (Colombia) as co-chairs from the developing countries, with Krishnan serving as co-chair for the first two sessions and Rodriguez for the final two sessions. The issues debated in IPF-1 included the implementation of United Nations Convetion for Environmental Development's (UNCED) decisions related to forests, coordination of bilateral and multilateral assistance, scientific research and forest assessment, criteria and indicators for sustainable forest management, trade in forest products, and review of international organisations and multilateral institutions. It also discussed possible contributions to their work from ongoing processes, surbh as the biodiversity convention, and from expert meetings that will be sponsored by individual countries and international organisations. The debate during the last two ways Of IPF-2 was indicative of the status and ultimate meaning of the entire session. In refusing to grant authority to the meeting's conclusions and insisting that all discussions were transitional, delegates acknowledged what their fairly non-committal statements had been indicating for two weeks: IPF-2 was a warm up. Yet even if delegations were deliberately structured to initiate discussion without negotiations on less controversial, substantive matters, IPF-2 did illuminate areas that may remain contentious through the remainder of the Panel's work. On questions like the relative emphasis on forests and forestry, the roles of national or global measures, and the IPF's relationship to other negotiations and bodies, this meeting sketched some of the boundaries and turning points of delegates' early collective thinking. On the impact of air-borne pollutants, the European Union (EU) said that air pollution is an external factor that cannot be influenced by the forest sector itself. The EU supported the proposed topics for consideration and highlighted the need for national commitments. Almost all the countries discussed their problems and gave suggestions. Delegates from Denmark said that the link between pollutants and elemental inputs from the atmosphere should be considered during afforestation efforts. Germany said that air pollution illustrates that sustainable development of forests is related to factors beyond control of the forest community. It supported monitoring effects over long periods, raising awareness to influence politicy decisions and taking measures to improve forests stand. Holdgate introduced the programme for needs and requirements of countries with low forest cover (LFCS), and UNEP senior programme officer Bai Mass Taal introduced the document which attempts to identify the Ucs based on FAO statistics and definitions. It concludes that LFCS require cooperation to reduce their dependence on foreign forest goods and services, and that they may consider investing in "minimum permanent forest estate". The document also proposes actions. Australian delegates said that the needs of developed and developing countries should be identified. Work should be done on inventory methodology, and greater emphasis given to timber production values. Plantations can contribute directly to protecting biodiversity and indirectly to decreasing pressure on native forest resources. While Iran urged the panel to consider global issues and to examine the causes behind LFCS such as poverty and the lack of technology and expertise, Colombia, which has a relatively high forest cover, said that the list of recommendations should be prioritised so that all countries can improve degraded areas. A number of delegates and NGOs suggested that the IPF needs to clearly define how it will reconcile forests, including their ecological, social and aesthetic goods and services, with forestry, which has its primary focus on timber production and ech6nomic values. Interventions and reports pointed to imbalances and preferences in both directions. One delegate noted that a document explaining the cause of low forest cover did not refer to timber extraction. 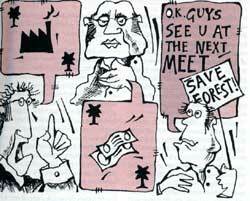 Delegates and-observers say that the attention to,forestry is partly an institutional issue. Many IPF delegates are from forestry or economic, rather than environmental ministries. Furthermore, the bodie& preparing discussion reports have traditionally dealt primarily with the timber value of forests. The debate over the role, of plantations was another aspect of the balance of forests and forestry concerns. A number of delegations said repeatedly that plantations have a role to play by taking production pressure off natural forests. NGos and a small number of delegations resisted assigning a role to plantations, suggesting that if they replace natural forests they threaten biodiversity and other values that are less directly economic. Much of the debate at the IPF-2 seemed to demonstrate a lack of coordination with other fora. Several times delegations admonished the Panel to consider its terms of reference and remain focused. An example of this was Argentina's comment that the debate on traditional forest-related knowledge resembled a session of the Convention of Biological Diversity's (CBD) Conference of the Parties. Much of the discussion of this programme element focussed on the potential commercial value of traditional knowledge, even more explicitly than the CBD. Other areas of overlap included benefits-sharing, although without explicit mention of intellectual property rights or prior informed consent. The discussions on finance, production and consumption, and timber certification at IPF-2 demonstrated that delegates were largely unaware of progress made at the Working Group on Finance. Furthermore, by the last day, some delegates tried to. further extend IPF'S mandate, adding, for example, seemingly unrelated items of biotechnology and biosafety to the co-chairs' summary on traditional forest-related knowledge. The issue of international institutions and relevant legal mechanisms was given initial consideration in Geneva, as m+dated by IPF-1. Delegates welcomed technical input from the Swiss/Peruvian initiative and other guidance in this area. Nevertheless, till date the IPF has no4tt solicited positions on its ultimate rec6mmendations to the broader world of forest policy. Within the initial comments on institutional and legal instruments, consistent views on the existence of Institutional gaps or overlaps have led to liproliferation of suggestions for the proper response. Those suggesting criteria and indicators or certification beyond the national level have not yet explained how to pursue or implement those objectives. What the IPF has expressed is an intention to determine its own priorities. A number of delegations have suggested that the CBD should not address forests or forestry policy beyond its implications for biodiversity. Additionally, the discussion offinance issues suggests that some believe the IPF Must act independently, even when issues are concurrently considered by other bodies. At this juncture, it is impossible to say what recommendations, agreements or commitments the IPF might produce until delegates agree that the time for negotiation has arrived. The discussions initiated at IPF-2 will no doubt reach that point during the Panel's final two sessions.